Narine to Russell and it’s a SIX. This is the beauty of cricket. Posting a total was not enough for TKR. Dew and the Andre Russell show out-played Trinbago Knight Riders bowlers. In Today’s Dream11 Fantasy Cricket Match of TKR vs SKN 5th T20, CPL 2018, we will cover Pitch Report of Queen’s Park Oval, Port of Spain, Trinidad, Probable Playing 11, Fantasy Cricket News and Tips, Toss Prediction, and Who Will Win the 5th T20? Who Will Win the 5th T20 Match, Between TKR vs SKN and Toss Prediction? Where Can You Watch the Live Streaming of TKR vs SKN, 5th T20 or Channels to Watch? TKR had to defend a huge total in the previous match but they failed to do so. So far Trinbago Knight Riders have played two matches, won one and lost one. On the other hand, St Kitts and Nevis Patriots have played one game and lost. According to our astrology prediction, TKR will win the match. The team winning the toss will opt to bowl first as dew will play an important factor and chasing will become comparatively easy. According to our astrology prediction, TKR will win the toss ask SKN to bat first. Date: The match will be played on the 12th of August 2018 (Sunday). Match: Caribbean Premier League, 2018, TKR vs SNP, 5th Match. Venue: Trinidad, Queen’s Park Oval, Port of Spain. Time: 12:00 AM GMT, 5:30 AM IST, 8:00 PM LOCAL. The bowler had to face the force of Russell in the last match. It was a nightmare for the bowlers. Even the dew favoured the batsmen. The pitch will be the same as of yesterday’s match and a high score is expected. The dew will make it easy for the batsmen to score runs in the second half. The spinners can take the benefit of the pitch before the dew comes. Another high scoring match is expected. Fantasy Cricket Tips: Try to take hard hitters in your team as the pitch is expected to be a batting-friendly and the dew will provide some extra help and tough time for the bowlers. It is expected to be partly cloudy. The rain in the morning may help the seamers initially. There is no sign of rain at the time of the play and the full match is expected. It is going to be a hot and humid day. The temperature is expected to be 27-Degree Celsius and the humidity to be 87%. Dew will come into play and the bowlers will have to face a tough time. Pro Tip: Due to rain in the morning the seamers will get some movement in the initial couple of overs. 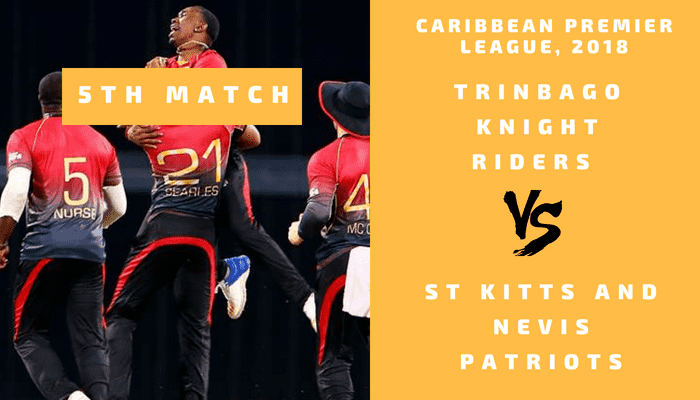 The statistics clearly show that Trinbago Knight Riders have dominated St Kitts and Nevis Patriots in the last five matches. TKR has won four matches out of five whereas SKN managed to win only once. In the last encounter, TKR defeated SKN by 3 wickets with 6 balls remaining and let me tell you this happens to be the final match of last year. The average second inning score of this ground is 123. Highest total on this ground is 159/6 in 20 overs by IND vs WI. Lowest total on this ground is 105/10 in 19.5 overs by ZIM vs WI. Star Sports has all the exclusive rights to broadcast the live coverage of Caribbean Premier League, T20, 2018 (CPL) in India and its Subcontinent Countries like Pakistan, Sri Lanka, Afghanistan, Bangladesh, Maldives, Bhutan, and Nepal. Hotstar Digital platform (Website and App) will show the live streaming. In UK (United Kingdom), Sky Sports has taken all the exclusive rights to broadcast the live coverage of Hero Caribbean Premier League (CPL). All the matches will be live streamed by Sky Sports in UK and Ireland. Sky Go and Now TV digital platform will show the live coverage in its Digital Platform (website and App). In the US (United States), Willow TV will broadcast all the matches and the live coverage of CPL 2018. In Caribbean Region, SportsMAX and ESPN will broadcast the live coverage of Caribbean Premier League, 2018 (CPL T20). FOX SPORTS has taken all the exclusive rights to broadcast the live coverage and live score ball by ball of CPL T20 2018. Colin Munro, Brendon McCullum, Chris Lynn, and Dwayne Bravo were the key contributors of previous games. Ali Khan proved to be a good option with fewer credits. He can be the most economical option. Brendon McCullum, Colin Munro, and Chris Lynn will lead the batting once again. Losing the last match will not lead to any change in the team. TKR will play with the same playing 11. Colin Munro is the most valuable and important player for TKR. Trinbago Knight Riders have played two matches, lost one and won one match. Brendon McCullum, Sunil Narine, Shannon Gabriel, Fawad Ahmed, Chris Lynn, Dwayne Bravo (c), Colin Munro, Denesh Ramdin (wk), Darren Bravo, Ali Khan, Javon Searles. Fawad Ahmed, Denesh Ramdin (wk), Amir Jangoo, Terrance Hinds, Dwayne Bravo (c), Nikita Miller, Sunil Narine, Anderson Phillip, Chris Lynn, Javon Searles, Colin Munro, Khary Pierre, Brendon McCullum, Kevon Cooper, Darren Bravo, Shannon Gabriel, Ali Khan, Hamza Tariq. Chris Gayle, Sheldon Cottrell and Sandeep Lamichhane were the key contributors of the last match. Evin Lewis can play a vital role today. Losing the first match may not make any sense to change the team. SKN may play with the same playing 11. St Kitts and Nevis Patriots have played one game and lost that. Carlos Brathwaite, Chris Gayle (c), Sandeep Lamichhane, Devon Thomas (wk), Sheldon Cottrell, Tom Cooper, Anton Devcich, Ben Cutting, Alzarri Joseph, Evin Lewis, Brandon King. Mahmudullah, Chris Gayle (c), Sheldon Cottrell, Hayden Walsh, Devon Thomas (wk), Carlos Brathwaite, Evin Lewis, Jeremiah Louis, Tom Cooper, Sandeep Lamichhane, Ben Cutting, Fabian Allen, Anton Devcich, Shamarh Brooks, Brandon King, Ibrahim Khaleel, Alzarri Joseph, Javelle Glen. Fantasy Cricket Expert Tips: The above players are safe players and are most likely to perform today. Make a combination of the above players for multiple teams. Conclusion: This is it for Today’s Dream11 Fantasy Cricket Match Prediction of TKR vs SKN, 5th T20 Match, which will be played on Sunday 12th August. We have covered all the details required to win any fantasy leagues. We have covered players recent and past performance, dream11 guru and crictom prediction, all the latest news and updates of Trinbago Knight Riders Team and St Kitts and Nevis Patriots Team, weather report of Trinidad, dream 11 best teams, keys players, the best choice for captain and vice-captain, where to watch the live match of TKR vs SKN, 5th T20 Match and the details of live streaming of Caribbean Premier League (CPL), 2018.